I PURCHASED THESE VINTAGE STOCKINGS SEVERAL YEARS AGO AT AN ESTATE SALE AND THEY ARE THE FIRST I’VE SEEN IN THIS BRAND! THEY ARE MICROMESH IRONWEAR INSURED STOCKINGS. APPARENTLY WHEN ORIGINALLY PURCHASED FROM “MISS AND MRS. SHOP” THEY WERE INSURED/GUARANTEED – SEE PHOTO. THERE ARE 2 PAIRS IN BOX, SIZE 10 ½ M, AND ARE A VERY PRETTY SOFT WHITE COLOR. BASED ON THEIR COLOR, I WOULD SURMISE THEY WERE PRODUCED FOR HEALTH CARE WORKERS (NURSES, SENIOR CAREGIVERS, ETC). THEY ARE SEAMLESS WITH REINFORCED HEEL AND TOE. WHEN I PURCHASED, STOCKINGS WERE IN A VINTAGE CLAUSSNER HOSIER BOX BUT I COULD FIND NO EVIDENCE OF THEIR BEING A CLAUSSNER PRODUCTION. I COULD FIND NO SIZE INFORMATION ON THE PACKAGE NOR A NAME FOR THE COLOR BUT YOU CAN SEE THE STOCKINGS FROM FRONT OF PACKAGE. I TRIED TO PEEK AT THE BOX BUT THE OUTER PACKAGING IS TOO FRAGILE AND TEARS EASILY SO I WAS UNABLE TO SEE THE STOCKING SIZE. 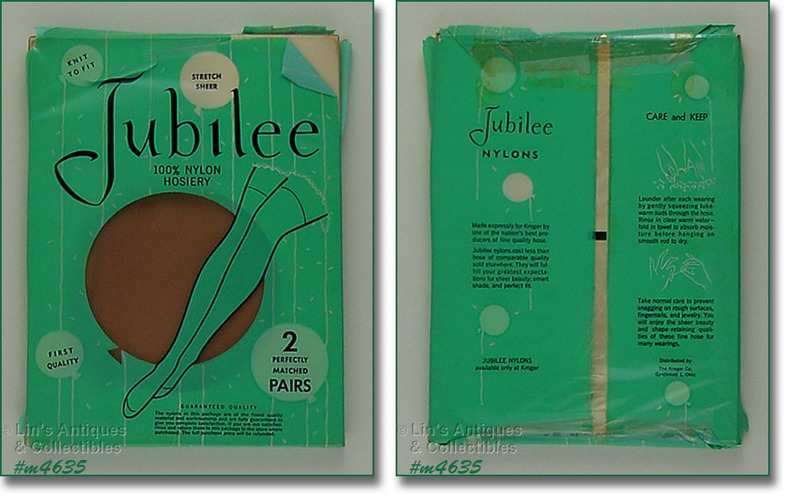 I FOUND IT VERY INTERESTING THAT PER PACKAGE – JUBILEE NYLONS WERE MADE “EXPRESSLY FOR KROGER” AND “DISTRIBUTED BY THE KROGER CO, CINCINNATI 1, OHIO”. 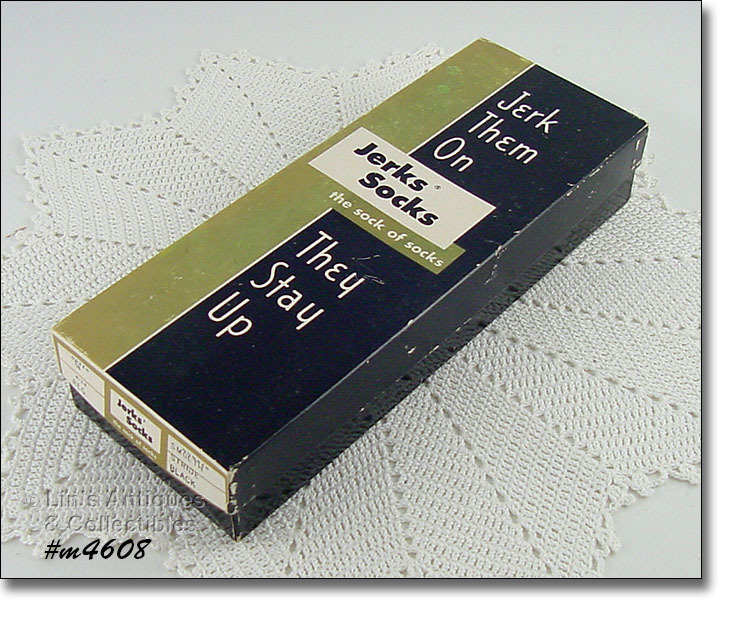 THIS LISTING HAS 2 PAIRS MINT IN ORIGINAL PACKAGE “FINE SEAMED 60/15 SHEERS”. PER PACKAGE, THEY ARE SIZE 9, 29-30”, AND THE COLOR IS GOLDEN PENNY. THEY HAVE SAME COLOR SEAMS AND REINFORCED HEELS AND TOES. 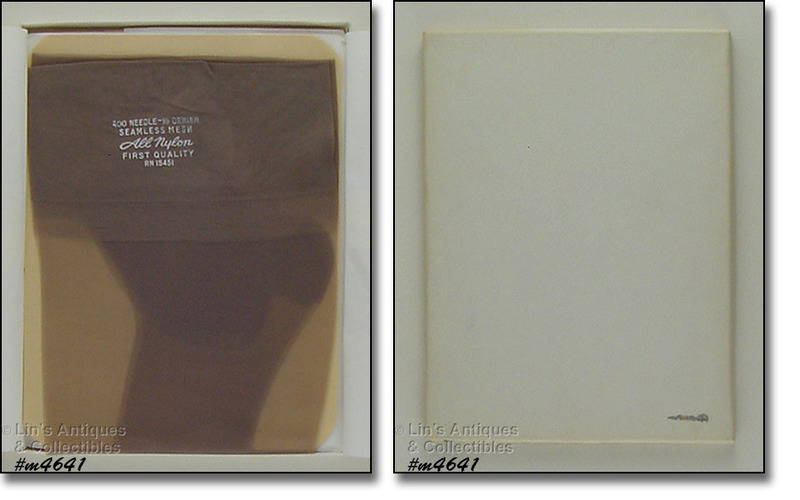 PACKAGE IS DATED 1962. 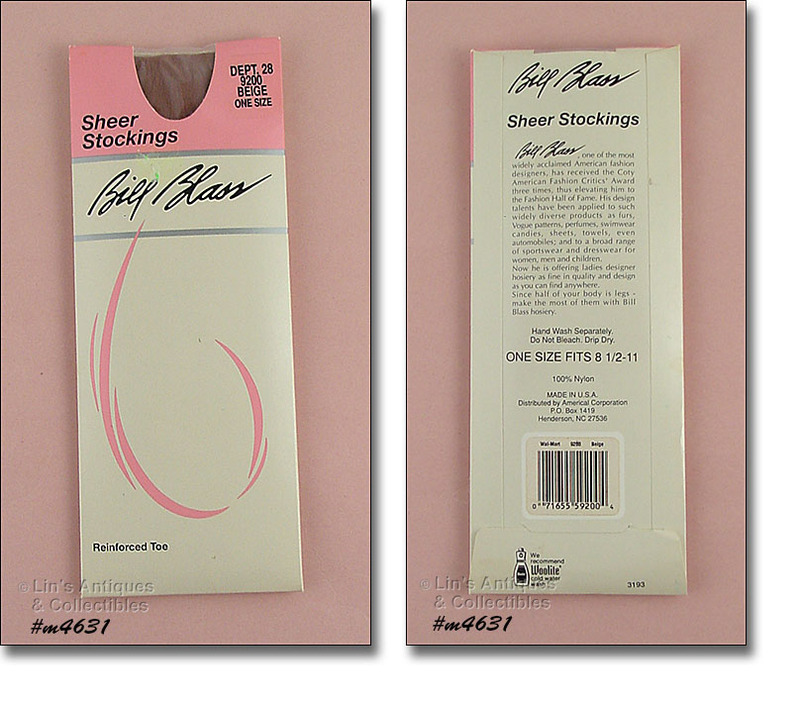 VINTAGE SHEER STOCKINGS BY BILL BLASS! NEVER REMOVED FROM PACKAGE, STOCKINGS ARE BEIGE COLOR WITH REINFORCED TOE AND ONE SIZE FITS 8 ½ - 11. 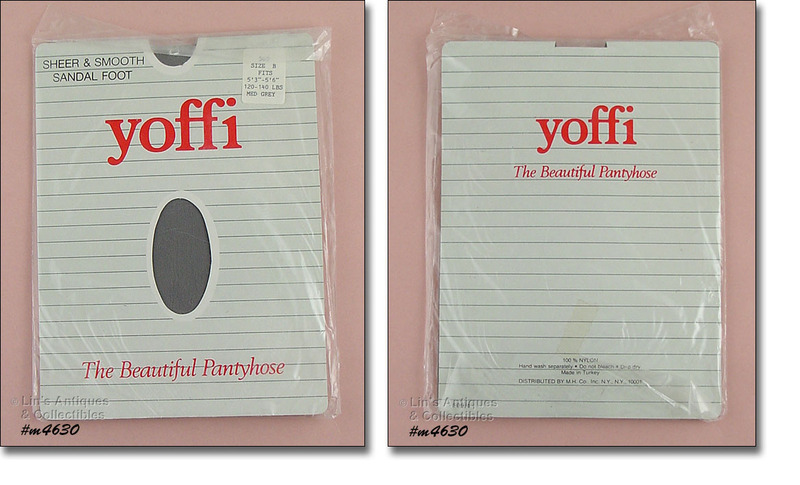 VINTAGE UNOPENED PACKAGE OF YOFFI PANTYHOSE! THESE ARE “SHEER AND SMOOTH SANDAL FOOT” 100% NYLON, SIZE B (5’3” – 5”6”, 120-140 LBS. ), AND THE COLOR IS MEDIUM GREY. 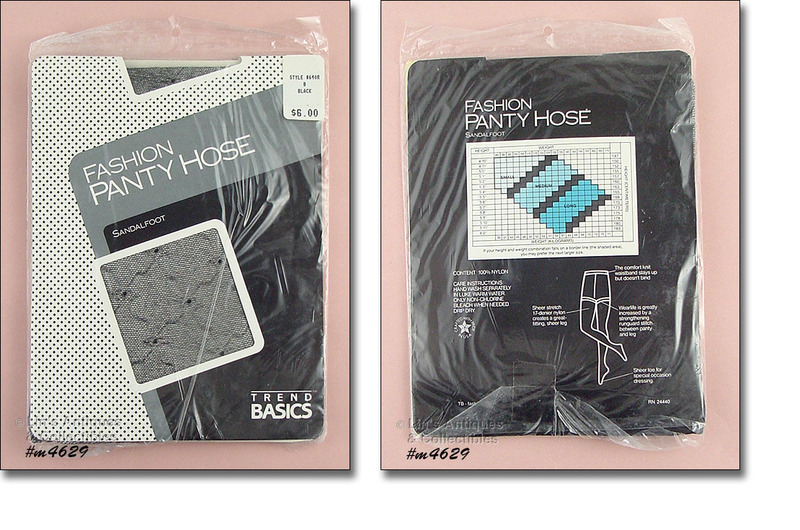 VINTAGE UNOPENED PACKAGE TREND BASICS PANTYHOSE! THESE ARE 17 DENIER 100% NYLON, SANDAL FOOT, SIZE B (5’4” – 5’8”, 100-145 LBS. ), AND ARE BLACK COLOR WITH A DESIGN WOVEN INTO THEM (SEE PHOTO). 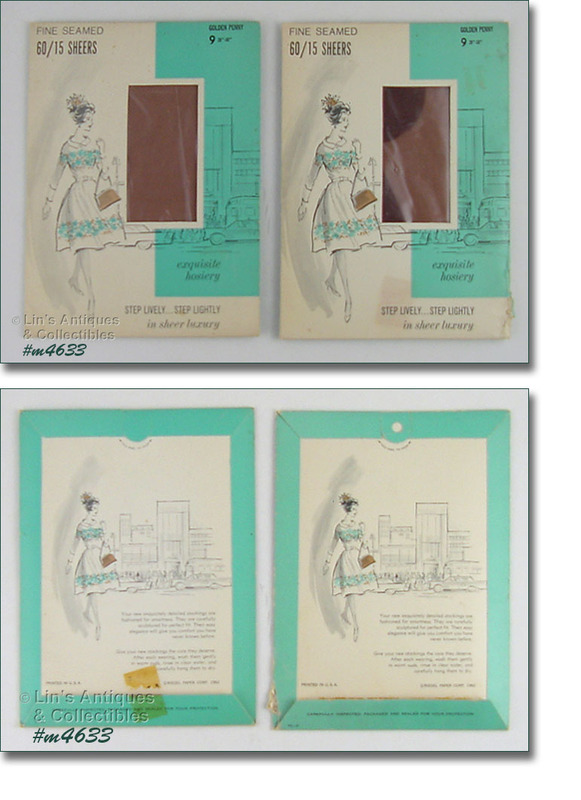 NEW IN ORIGINAL UNOPENED PACKAGE, THIS LISTING HAS PANTYHOSE BY “ARTLEY FASHION CENTS”! THE COLOR IS GREY, SIZE C (5’4” – 5’8”, 135 – 160 LBS. ), 100% NYLON WITH SANDAL FOOT. THIS PARTICULAR BRAND OF PANTYHOSE WAS ONE OF MY FAVORITES BECAUSE OF THE WAY THEY LOOKED ON, THEY ARE SHEER AND ARE SO COMPLIMENTARY TO YOUR LEGS. THE DOWNSIDE IS THE FACT THAT THEY ARE SO SHEER – VERY EASY TO POKE A FINGERNAIL THROUGH AND THESE HAVE TO BE PUT ON THE WAY YOU’RE SUPPOSED TO – ROLLING THEM UP YOUR LEG, NOT PULLING THEM UP. WITH THAT BEING SAID, THE END RESULT/LOOK IS WELL WORTH THE EXTRA CARE/HANDLING OF THESE PANTYHOSE. YOU’LL LOVE THEM! 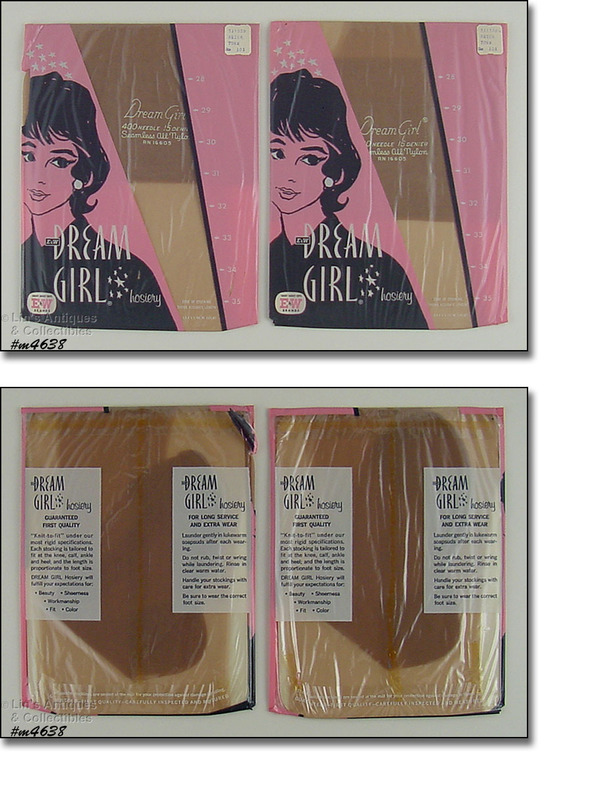 NEVER REMOVED FROM PACKAGE, THESE PANTYHOSE ARE FROM THE FASHION WEST COLLECTION! THEY ARE SANDAL FOOT, 100% NYLON, AND ARE SIZE B (5’1” – 5’7”, 105-135 LBS.). THE COLOR IS MALT AND THEY HAVE A DESIGN WOVEN INTO THEM – SEE PHOTO! NEVER REMOVED FROM PACKAGE, THIS LISTING HAS 1 PAIR OF VANITY FAIR SHEER STOCKINGS! THEY HAVE REINFORCED HEEL AND TOE, ARE BLACK COLOR, AND SIZE MEDIUM (9 ½ - 10). I PURCHASED THESE (AND #M4625 THROUGH #M4631) DURING MY “CORPORATE” YEARS – 1980S THROUGH EARLY 1990S – ALL ARE NEW, NEVER WORN, NEVER REMOVED FROM PACKAGES. THIS LISTING HAS 2 PACKAGES OF PANTYHOSE BY HANES! 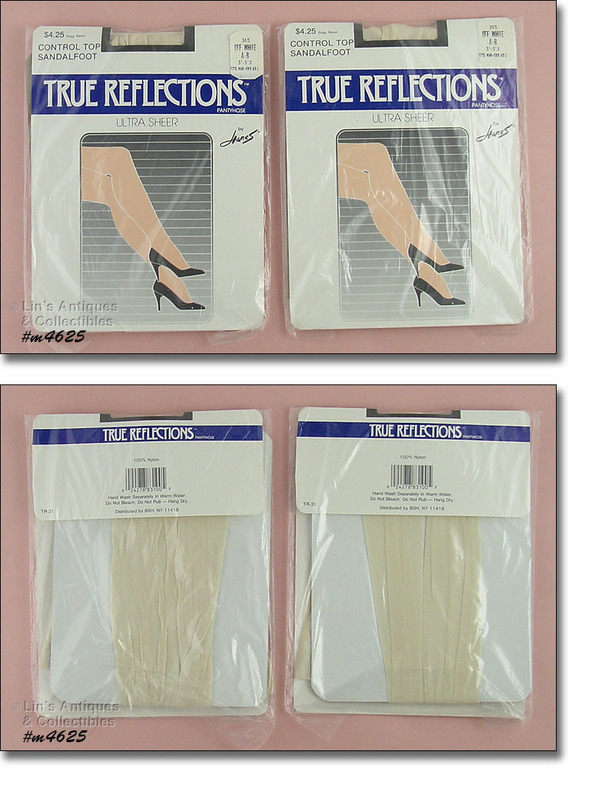 THEY ARE “TRUE REFLECTIONS” BY HANES, ARE OFF-WHITE COLOR, ULTRA SHEER, CONTROL TOP, SANDAL FOOT, AND SIZE A-B (5’ – 5’5”, 100-135 LBS.). NEVER REMOVED FROM PACKAGE. 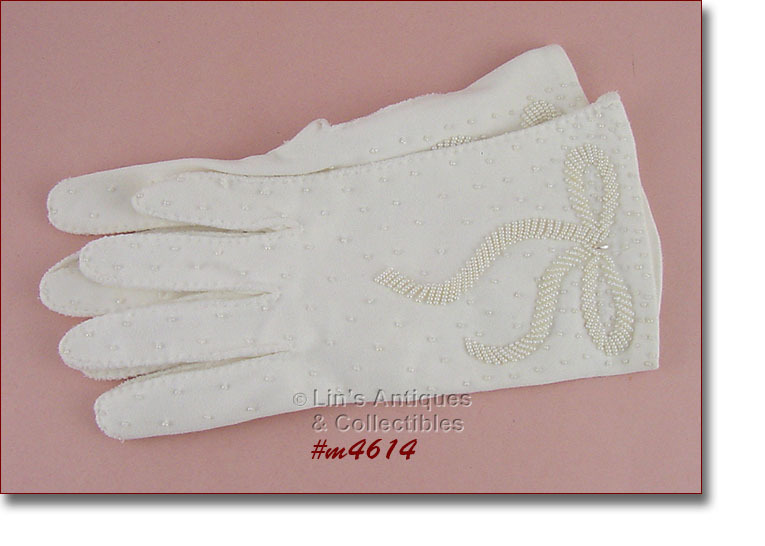 THESE WHITE GLOVES ARE SO PRETTY AND SUITABLE FOR A WEDDING OR ANY DRESS OCCASION! THEY HAVE LITTLE BEADS ON THEM AND A DECORATIVE LARGE WHITE BEAD “BOW”. GLOVES ARE SIZE 6 ½ - 7 AND MEASURE 8 ¾” FROM HEM EDGE TO TIP OF MIDDLE FINGER. GLOVES HAVE BEEN HAND-LAUNDERED AND LINE DRIED (BY ME). 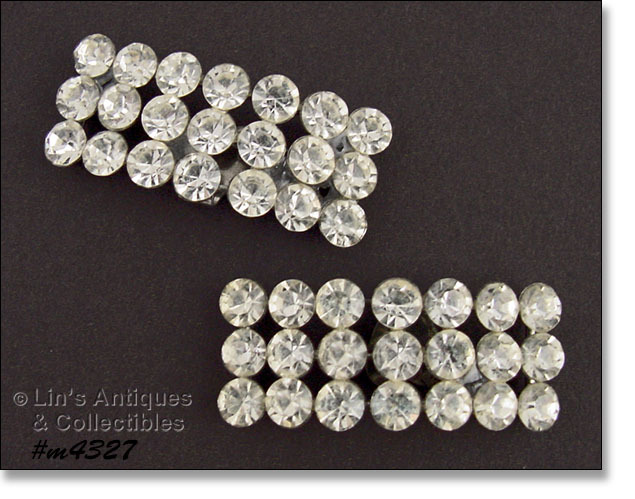 THEY ARE READY TO WEAR, GIVE AS A GIFT, OR DISPLAY. 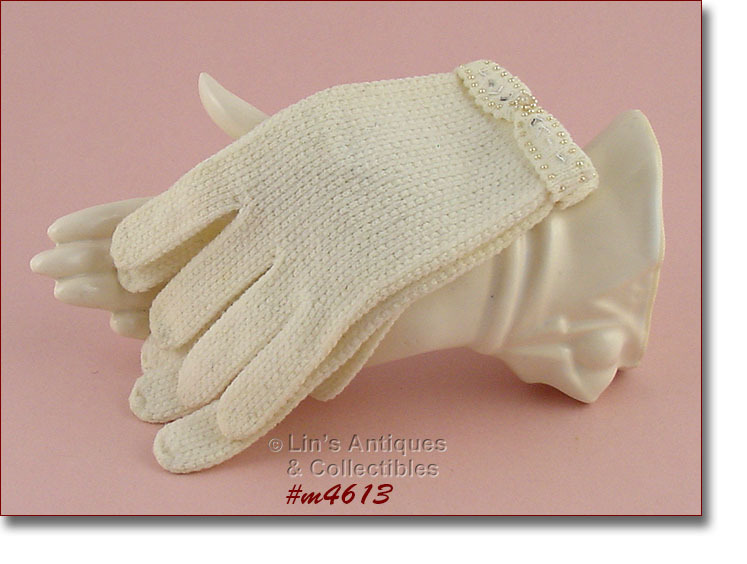 I USUALLY DON’T LIST THIS TYPE GLOVE BUT THESE ARE SO CUTE – STRAIGHT FROM THE 1950S! GLOVES MEASURE 7 ½” FROM HEM TO TIP OF MIDDLE FINGER, ARE SIZE 6, AND I BELIEVE THEY ARE A LIGHT WEIGHT WOOL BLEND. THE CUFF IS ADORNED WITH FAUX PEARLS AND GLASS TUBE SHAPED BEADS – SO VERY PRETTY. NICE GLOVES, NICELY PRICED! 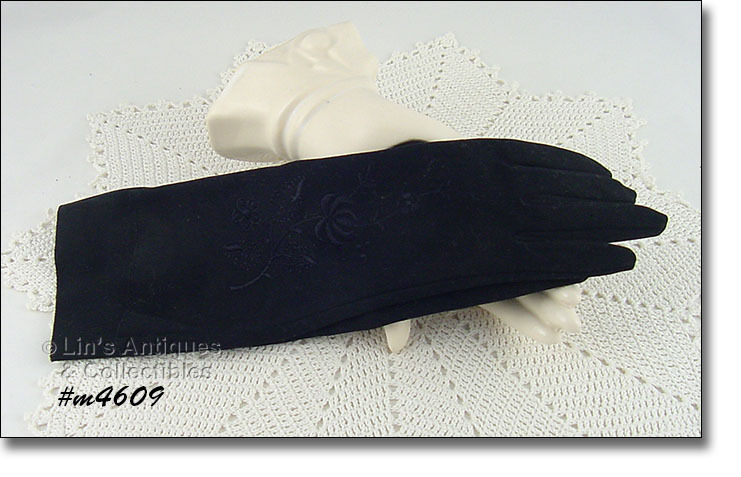 THESE SIMPLE WHITE GLOVES ARE “DRESSED UP” WITH A FAUX TORTOISE SASH/TYPE BUCKLE! THE BUCKLE IS DECORATIVE ONLY BUT IT ADDS A DASH OF COLOR. 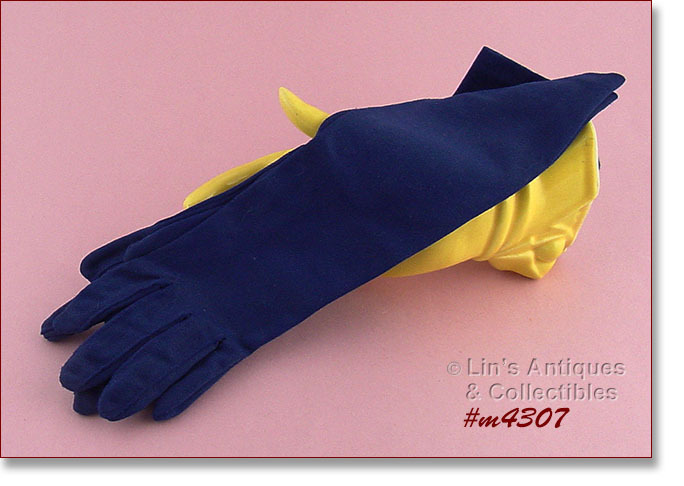 GLOVES ARE 100% NYLON, ARE SIZE 7, AND MEASURE 8 ¼” FROM HEM TO TIP OF MIDDLE FINGER. ANOTHER PAIR OF VERY PRETTY BLACK GLOVES! THESE ARE A RICH DEEP BLACK COLOR, ARE SIZE 6, AND MEASURE 10 ¼” FROM HEM TO TIP OF MIDDLE FINGER. 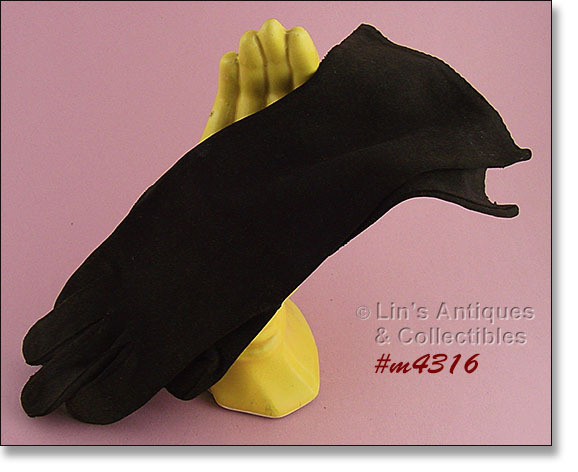 ANOTHER PAIR OF SUPER NEAT VINTAGE BLACK GLOVES! THESE MEASURE 14 ½” FROM HEM EDGE TO TIP OF MIDDLE FINGER AND ARE SIZE 6. THEY ARE MADE OF A NYLON BLEND FABRIC. VERY NICE! ANOTHER PAIR OF NEVER WORN VINTAGE GLOVES! 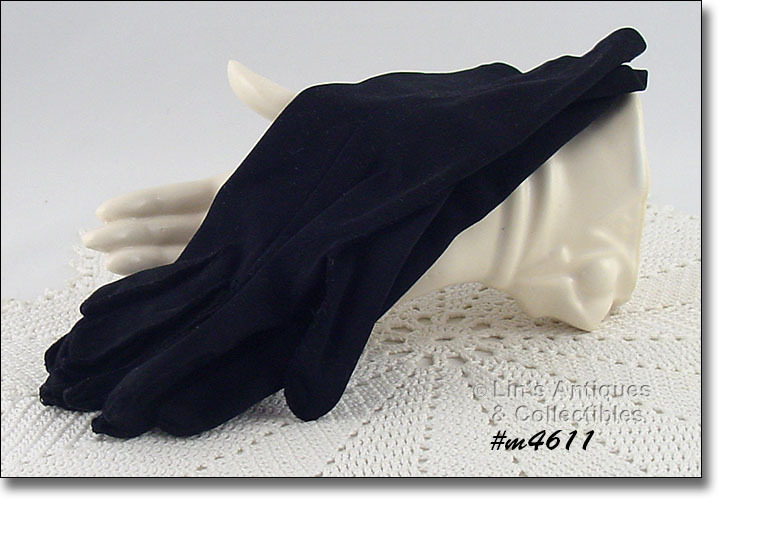 THESE GLOVES BEAUTIFULLY COMPLIMENT OUR BLACK CHAPEL SCARF WITH FLOWERS (ITEM #HAT308) THAT WE JUST LISTED. THE GLOVES HAVE A FLORAL DESIGN STITCHED IN BLACK AND UNFORTUNATELY, THE STITCHING WOULDN’T SHOW IN OUR PHOTO. 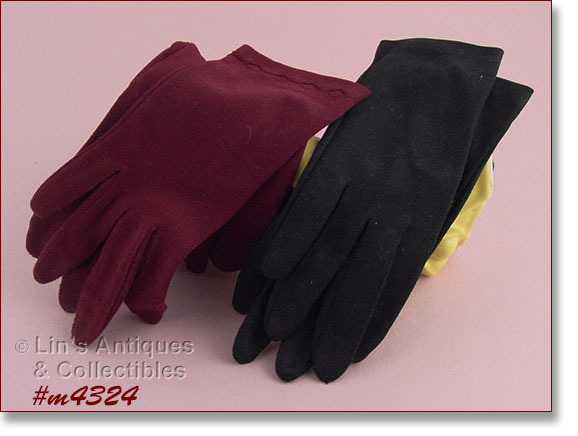 GLOVES ARE SIZE 6 ½, MEASURE 11 ¼” FROM HEM EDGE TO TIP OF MIDDLE FINGER, AND ARE “100% DOUBLE WOVEN COTTON”. WOW – WHAT A FIND! 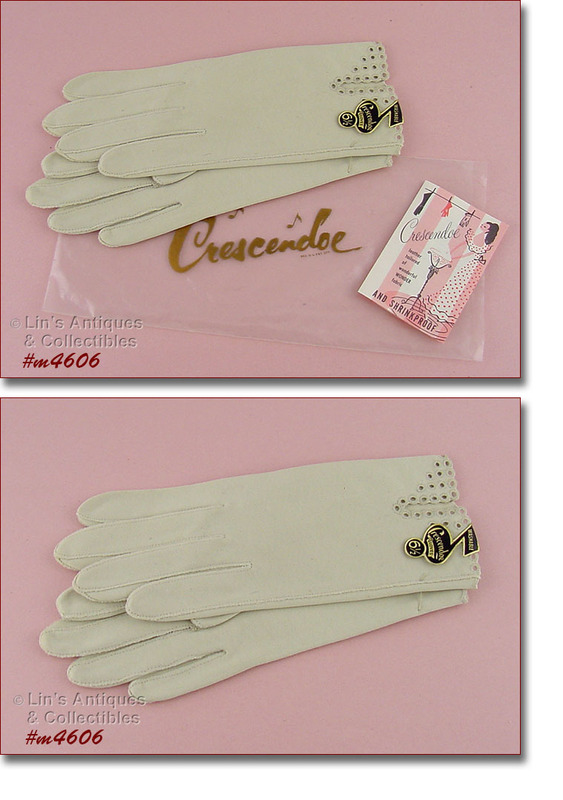 THIS LISTING HAS A PAIR OF CRESCENDOE VINTAGE GLOVES STILL IN THE ORIGINAL PLASTIC BAG WITH ORIGINAL PRODUCT DESCRIPTION AND CARE INSERT AND THE GLOVES ARE STILL SINGLE THREAD SEWN TOGETHER AT HEM – NEVER WORN! PER INSERT “IF WASHING INSTRUCTIONS ARE FOLLOWED, THIS WONDER FABRIC WILL NOT SHRINK AND WILL LOOK MORE DOESKIN-LIKE AFTER EACH WASHING” AND “LEATHER TAILORED BY LEATHER CRAFTSMEN, IT IS THE WORLD’S FINEST FABRIC GLOVE”. I AM AT A LOSS TO DESCRIBE THE COLOR – NOT IVORY, NOT BEIGE, NOT TAUPE BUT SOMEWHERE IN BETWEEN/COMBINATION OF ALL. 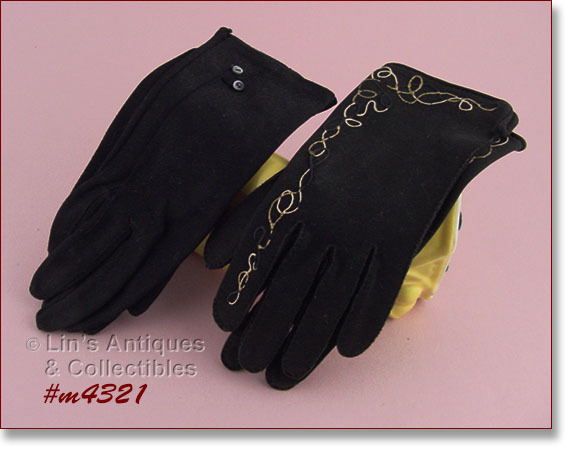 ANOTHER PAIR OF PRETTY BLACK VINTAGE GLOVES! THESE ARE SIZE 6 – 6 ½ AND MEASURE 16 ½” FROM HEM EDGE TO TIP OF MIDDLE FINGER. THEY ARE NOT SUEDE BUT THEY HAVE LIGHTWEIGHT SUEDE “FEEL” TO THEM. VERY NICE! ANOTHER GORGEOUS PAIR OF ELBOW LENGTH BLACK GLOVES! THESE ARE SIZE 6 AND ARE MADE OF A MORE SATIN/NYLON BLEND MATERIAL – THEY ARE MORE FORM FITTING WITHOUT MUCH “GIVE” IN THE FABRIC. GLOVES MEASURE 17” FROM HEM EDGE TO TIP OF MIDDLE FINGER. OH, THESE ARE NICE GLOVES! THEY’RE BLACK AND ARE MADE OF A FELT TYPE/FEEL MATERIAL THAT FEELS SO SOFT AGAINST YOUR SKIN. 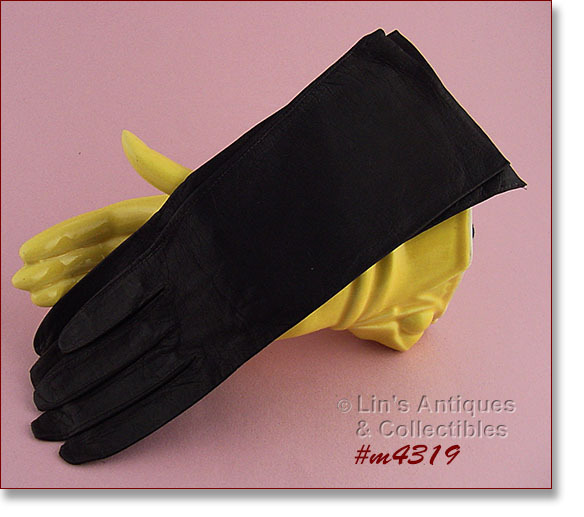 GLOVES ARE SIZE 7 AND ARE ELBOW LENGTH – THEY MEASURE 17 ½” FROM HEM TO TIP OF MIDDLE FINGER. 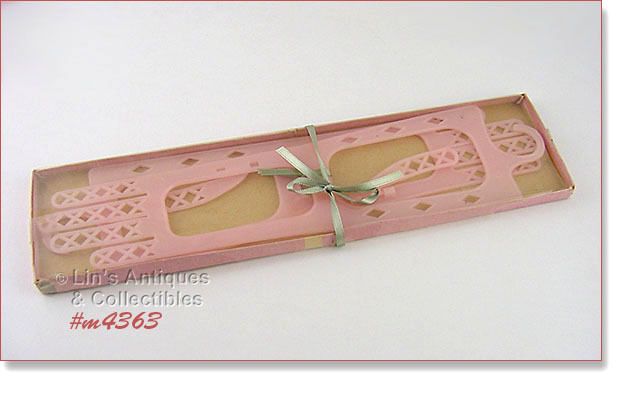 THIS LISTING HAS A PAIR OF GORGEOUS VINTAGE LADIES STOCKINGS – THESE ARE “BALLET” BY BURLINGTON! STOCKINGS ARE 15 DENIER DRESS SHEER, 100% NYLON, SIZE 9 ½ MEDIUM, AND THE COLOR IS “BLACK PEARL” – A BEAUTIFUL SHEER LIGHT BLACK COLOR. 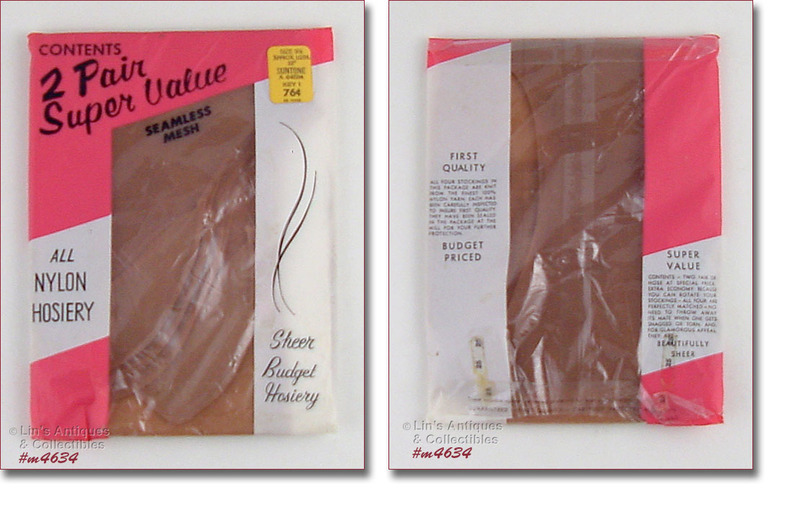 STOCKINGS ARE “FIRST QUALITY”, STILL IN ORIGINAL UNOPENED PACKAGE THAT SHOWS ORIGINAL PRICE OF 99 CENTS – WOW! 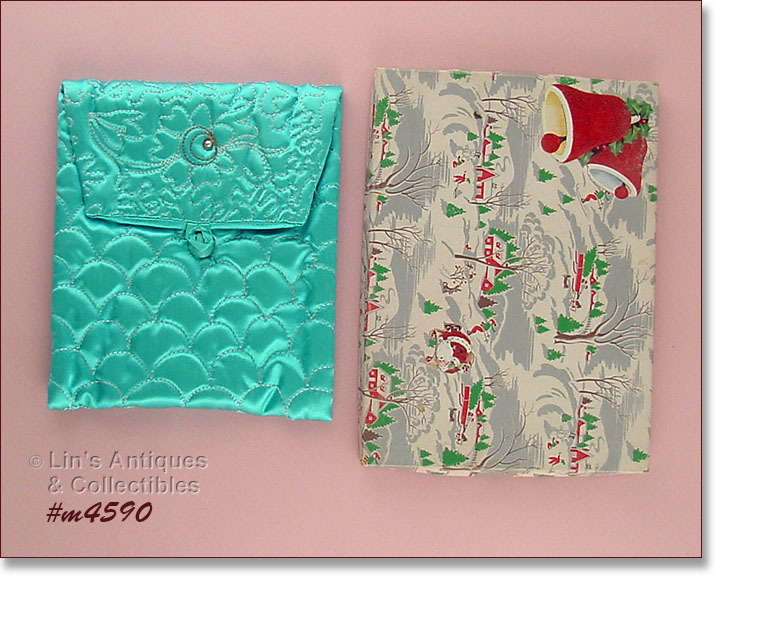 THIS LISTING HAS A GORGEOUS VINTAGE QUILTED HOSIERY OR HANKY HOLDER IN MINT CONDITION AND STILL IN THE ORIGINAL CHRISTMAS GIFT BOX! IT IS A BEAUTIFUL TURQUOISE COLOR WITH COVERED BUTTON CLOSURE. CENTER TOP IS ACCENTED WITH A FAUX PEARL BEAD. AT FIRST GLANCE, I THOUGHT THE BEAD HAD DISCOLORED THE SURROUNDING THREAD – NOT SO, THE THREAD IS A DIFFERENT COLOR THAN THE REST OF THE QUILTING THREAD! 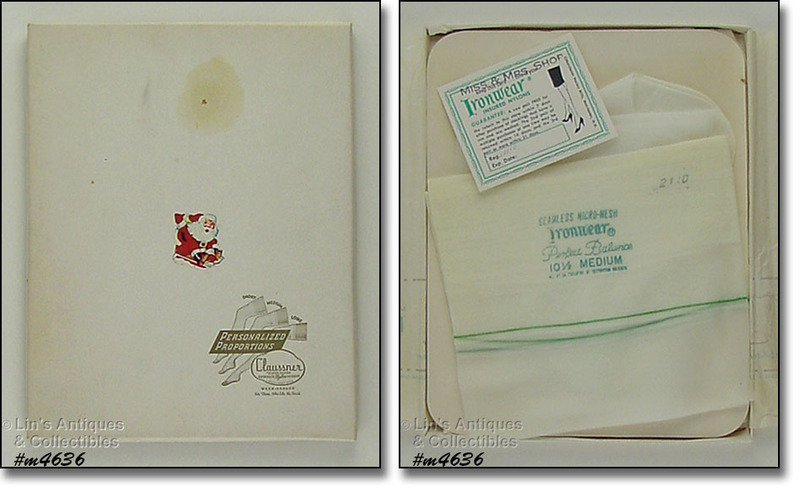 HOLDER HAS ORIGINAL INTERIOR TAG “HOLIDAY FAIR, COPYRIGHT DESIGN, MEDAYA & CO, NYC, MADE IN JAPAN”. HOLDER MEASURES 8 1/16” X 7”. THE VINTAGE GIFT BOX IS ALSO NEAT! 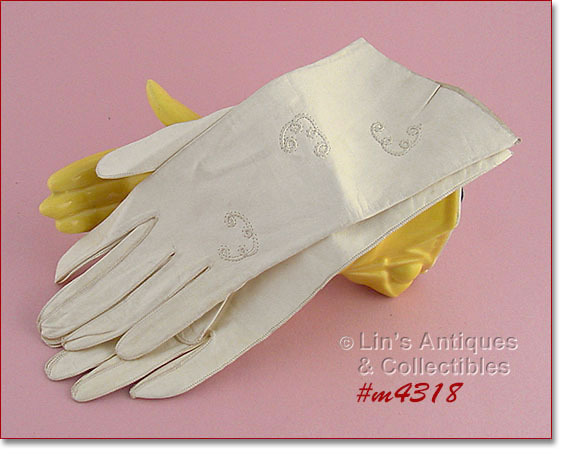 THIS LISTING HAS A VINTAGE PAIR OF WHITE LEATHER GLOVES! 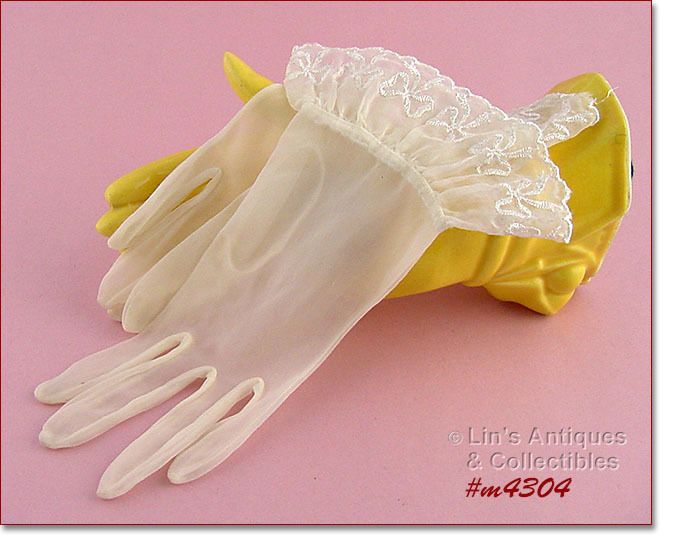 THEY ARE IN A VAN RAALTE PLASTIC BAG ALTHOUGH I COULD NOT FIND A MANUFACTURER’S TAG ON THE GLOVES. THEY ARE STAMPED INSIDE WITH THE NUMBER 6 AND MADE IN ITALY. THESE ARE QUALITY GLOVES, PROBABLY KID LEATHER BECAUSE THEY ARE SOFT AND SUPPLE AND WILL SHAPE TO YOUR HANDS. ALTHOUGH STAMPED WITH THE NUMBER 6, THESE ARE SMALL GLOVES. THEY MEASURE 8 ¼” IN LENGTH (FROM WRIST/HEM TO END OF MIDDLE FINGER) AND 2 ¾” WIDE (AT WIDEST). THEY ARE MEANT TO BE SNUG AND HAVE A BUTTON CLOSURE AT THE WRIST. 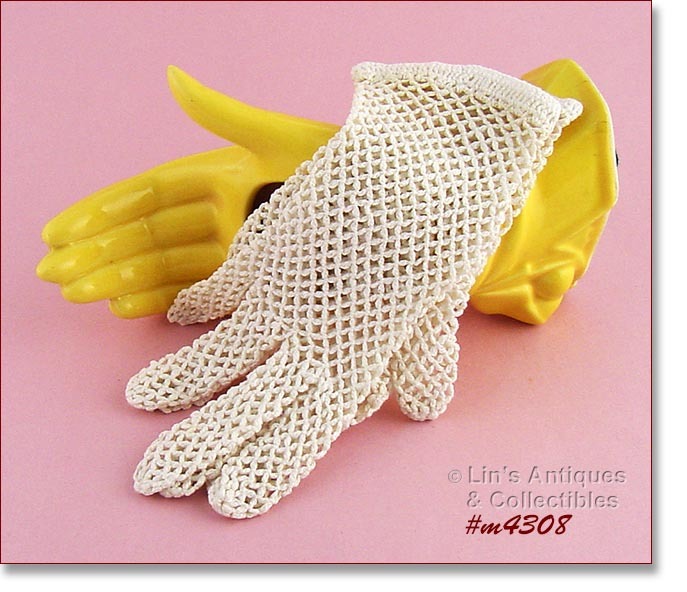 LOVELY VINTAGE GLOVES THAT APPEAR TO HAVE NEVER BEEN WORN! THESE LOVELY WHITE CROCHET GLOVES WERE HAND MADE IN IRELAND! WHEN I LAUNDERED THEM, THE TAG CAME LOOSE – IT READS – FRENCH PATTERN, 100% COTTON. THERE IS AN M FOR SIZE BUT WHILE THESE GLOVES DO STRETCH, THEY ARE SMALL AND I WOULD ESTIMATE THEM TO BE SIZE 5 OR 6. VERY NICE! 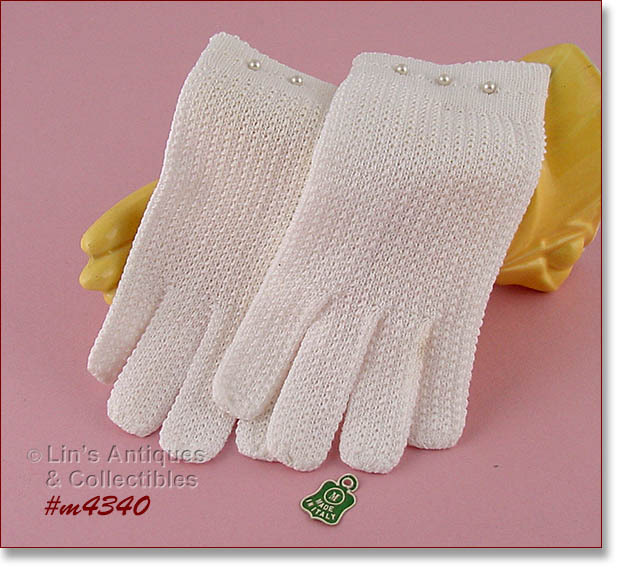 THESE ARE PRETTY GLOVES IN A NICE LIGHT BEIGE COLOR! THEY’RE IN SUPER CONDITION AND HAVE A VERY DECORATIVE “CUFF”. GLOVES ARE NYLON AND SIZE 6. NICE! 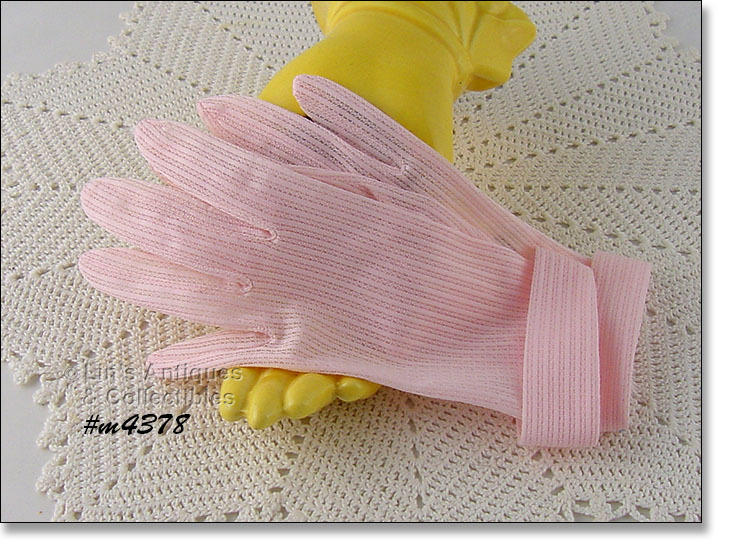 THESE VINTAGE GLOVES ARE SUCH A PRETTY COLOR – SOFT PINK – AND THEY ARE IN EXCELLENT, LIKE NEW CONDITION! PER TAG, THEY WERE MADE BY FOWNES AND ARE SIZE 6. NICE EASTER OR SPRING GLOVES! EXCELLENT CONDITION GLOVE DRYERS! THESE WERE MADE BY HANDIFORM, 389 FIFTH AVENUE, NEW YORK 16. DRYERS ARE IN THE ORIGINAL BOX (CLEAR PLASTIC COVER/LID IS MISSING) AND INSTRUCTIONS FOR USE ARE INSIDE BOX. IF YOU COLLECT AND/OR WEAR VINTAGE GLOVES, YOU NEED GLOVE DRYERS TO PROPERLY SHAPE YOUR GLOVES WHILE THEY ARE DRYING AFTER LAUNDERING. SUPER NEAT ITEM! 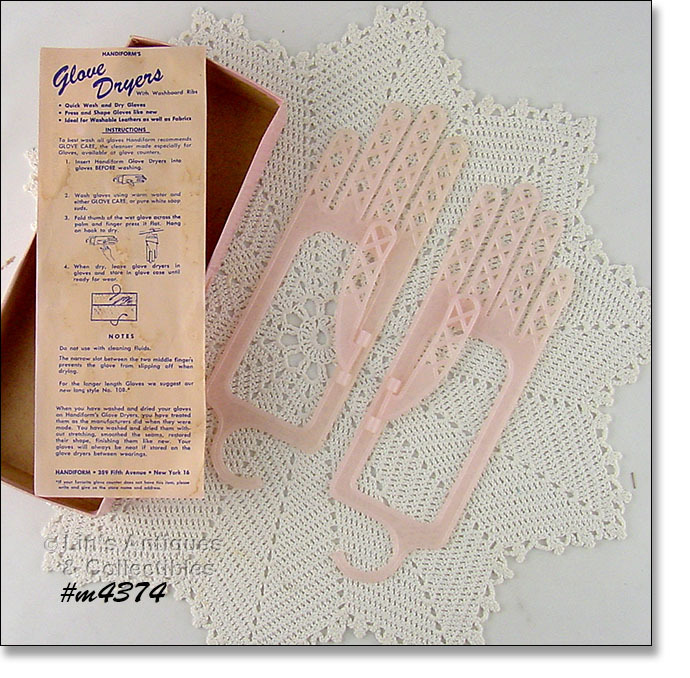 I HAVE COLLECTED VINTAGE CLOTHING AND RELATED ITEMS FOR MANY YEARS AND THIS IS THE ONLY GLOVE DRYING/SHAPING SET I’VE EVER SEEN FOR THE LONGER LENGTH GLOVES! THEY MEASURE 14” IN LENGTH (END OF MIDDLE FINGER TO TOP – NOT INCLUDING THE HANGER). 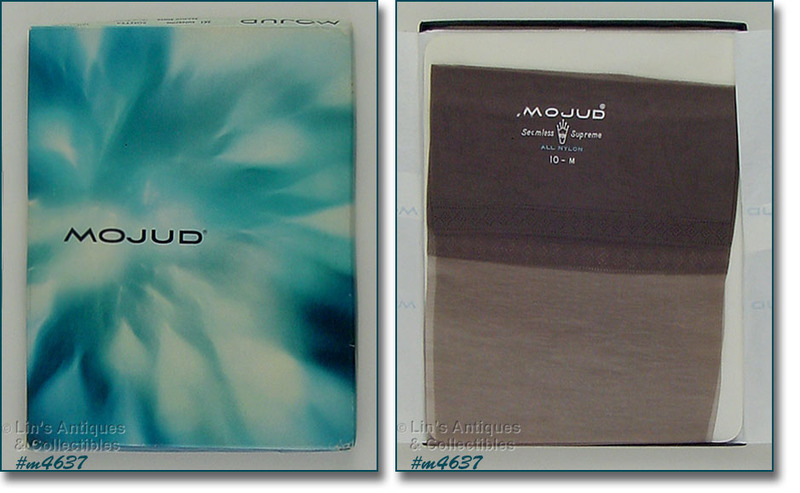 ALWAYS WELL CARED FOR AND STORED IN THE ORIGINAL BOX – SUPER!! 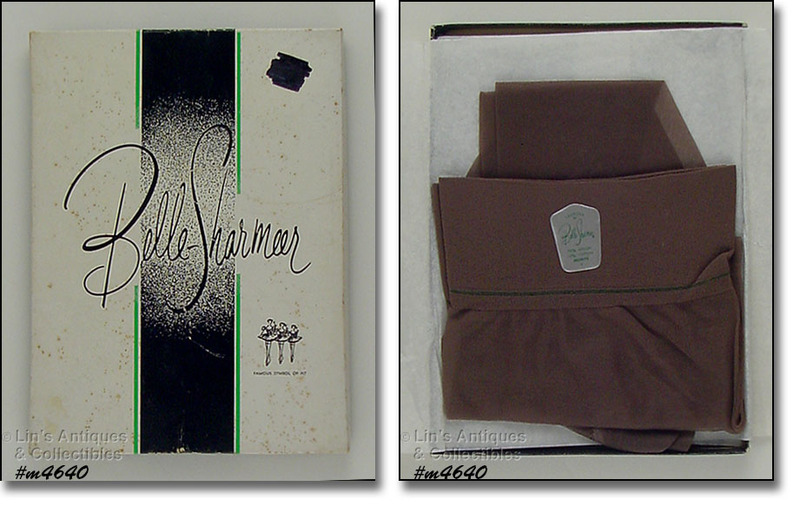 THIS LISTING HAS AN EXCELLENT CONDITION PAIR OF BELLE SHARMEER STOCKINGS! THESE ARE SEAMED STOCKINGS, SIZE 10, AND THE COLOR IS LIGHT TAUPE WITH SAME COLOR SEAMS. 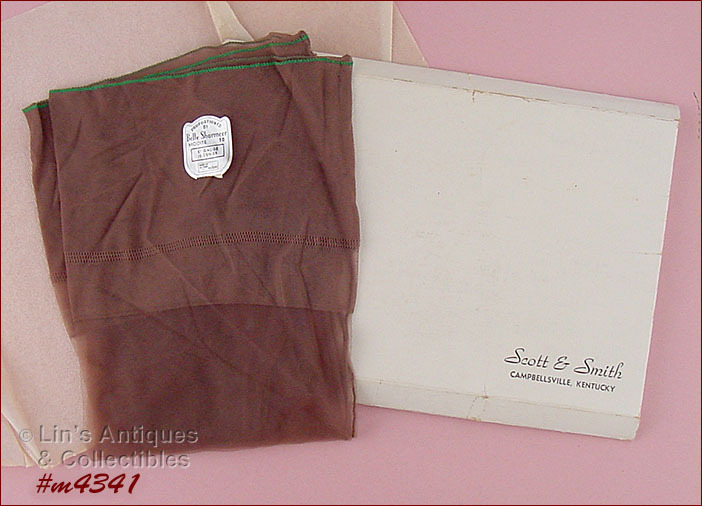 AS A GENERAL RULE, SIZE 10 VINTAGE STOCKINGS FIT UP TO SHOE SIZE 7 ½. NYLONS ARE IN THE ORIGINAL GIFT ENVELOPE FROM “SCOTT & SMITH, CAMPBELLSVILLE, KENTUCKY”. THEY ARE 51 GAUGE (51 KNITTING LOOPS PER 1 ½ INCHES) AND 15 DENIER (GOSSAMER SHEERS FOR “THE DRESSIEST OCCASIONS”). THESE GLOVES ARE SO PRETTY! THEY’RE WHITE WITH 3 FAUX PEARLS AT WRIST AND ARE SIZE 6 – 6 ½. THEY ARE IN EXCELLENT CONDITION (THERE’S A VERY TINY DISCOLORATION ON LEFT RING FINGER) – THAT’S IT! GLOVES ARE IN THEIR ORIGINAL “WEAR-RIGHT GLOVES” PACKAGING WITH ORIGINAL “MADE IN ITALY” TAG WHICH INDICATES SIZE TO BE M (MEDIUM). NEAT! 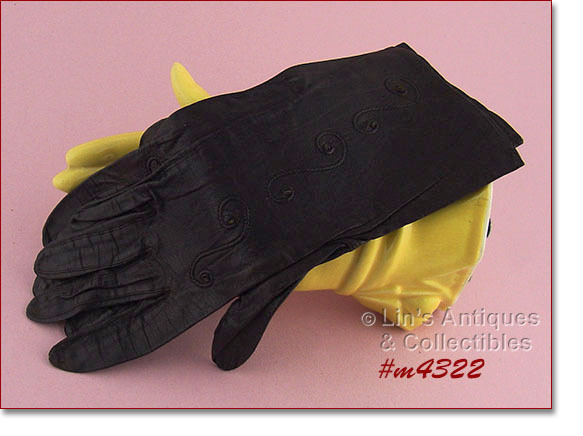 ANOTHER LOVELY PAIR OF GLOVES IN THIS LISTING! 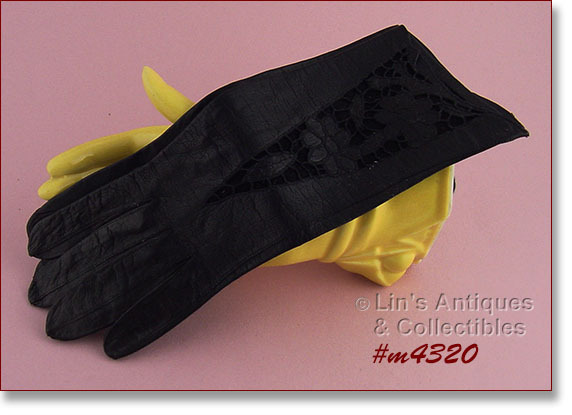 THESE ARE BLACK WITH ACCENT STITCHING AT HEM, MEASURE 9” TO TIP OF MIDDLE FINGER, AND ARE SIZE 6 ½.
I’VE GROUPED THESE 2 PAIRS OF GLOVES INTO ONE LISTING! THERE’S A PRETTY PAIR OF BLACK GLOVES THAT ARE SIMPLY STYLED WITH NO ADORNMENT OF ANY KIND. THEY HAVE ELASTIC AT INSIDE WRIST/HEM, MEASURE 8” TO TIP OF MIDDLE FINGER, AND ARE SIZE 6-6 ½. THE OTHER PAIR IS A VERY PRETTY DARK RED COLOR WITH PRETTY STITCHING AT OUTER WRIST/HEM. THEY MEASURE 8 1/8” TO TIP OF MIDDLE FINGER AND ARE SIZE 6 – 6 ½. VERY NICE! ANOTHER VERY NICE PAIR OF LEATHER GLOVES! THEY’RE DARK BROWN, MEASURE 10” TO END OF MIDDLE FINGER, AND ARE APPROXIMATELY SIZE 6 – 6 ½. PRETTY! 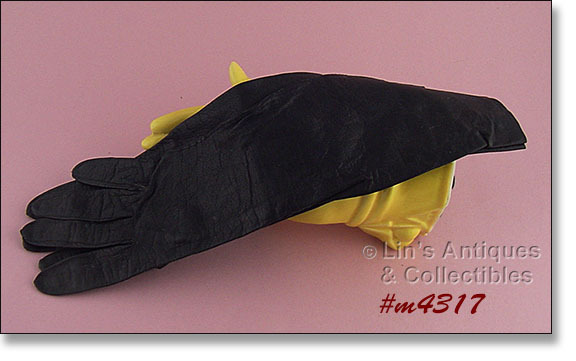 I’VE GROUPED THESE 2 PAIRS OF BLACK GLOVES INTO ONE LISTING! BOTH ARE SIZE 6-6 ½. THE PAIR WITH BLACK BUTTONS AT TOP MEASURES 8 ½” TO END OF MIDDLE FINGER AND THE OTHER PAIR MEASURES 8”. BOTH ARE VERY NICE! WOW – THESE GLOVES ARE GORGEOUS! THEY’RE MADE OF SOFT, SUPPLE BLACK LEATHER AND HAVE A BEAUTIFUL FLORAL LEATHER INSET. GLOVES MEASURE 10 ½” TO END OF MIDDLE FINGER AND I ESTIMATE THEM TO BE SIZE 6-6 ½. 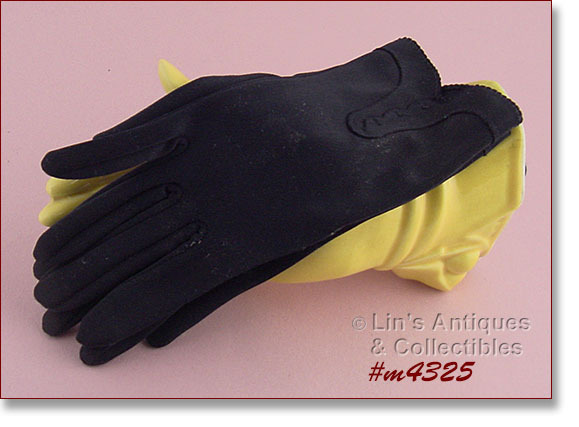 THESE VINTAGE LEATHER GLOVES APPEAR TO BE NEW AND UNUSED! THEY MEASURE 10 ¼” TO END OF MIDDLE FINGER AND I WOULD ESTIMATE THEM TO BE SIZE 6. THEY ARE IN A STETSON GLOVES BAG – I DON’T KNOW IF THEY’RE STETSON BECAUSE I DIDN’T SEE ANY IDENTIFICATION ON THE GLOVES. THEY ARE BEAUTIFUL GLOVES MADE OF SOFT LEATHER! 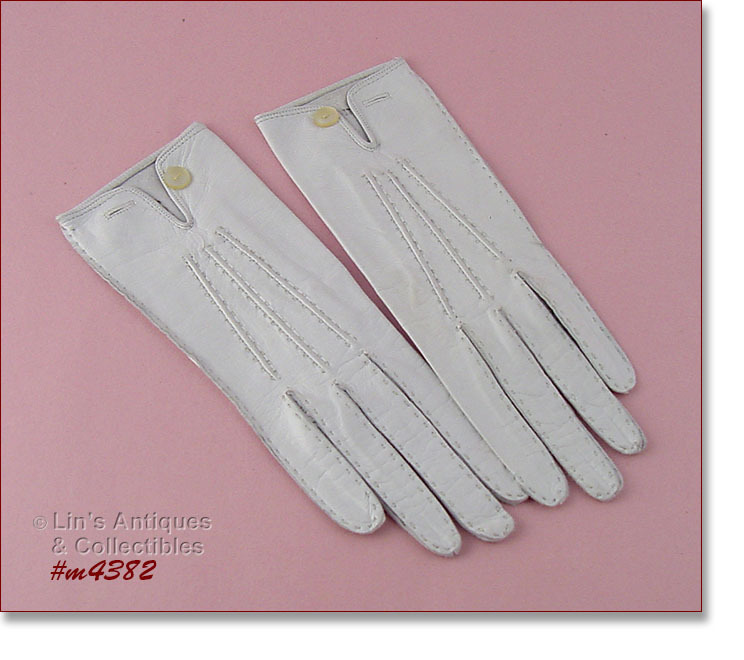 SUPER VINTAGE WHITE LEATHER GLOVES! THEY MEASURE 10 ¼” TO END OF MIDDLE FINGER AND ARE STAMPED INSIDE “PRIME QUALITY, ALEXETTE 6 ½”. LEATHER IS SOFT AND SUPPLE – NICE! VERY NICE BLACK LEATHER GLOVES! THEY’RE THE LONGER LENGTH – 14” TO TIP OF MIDDLE FINGER – AND I WOULD ESTIMATE THEM TO BE SIZE 6. VERY NICE BROWN GLOVES! THEY’RE SIZE 7 AND ARE THE LONGER LENGTH – MEASURE 13” TO TIP OF MIDDLE FINGER. PRETTY! 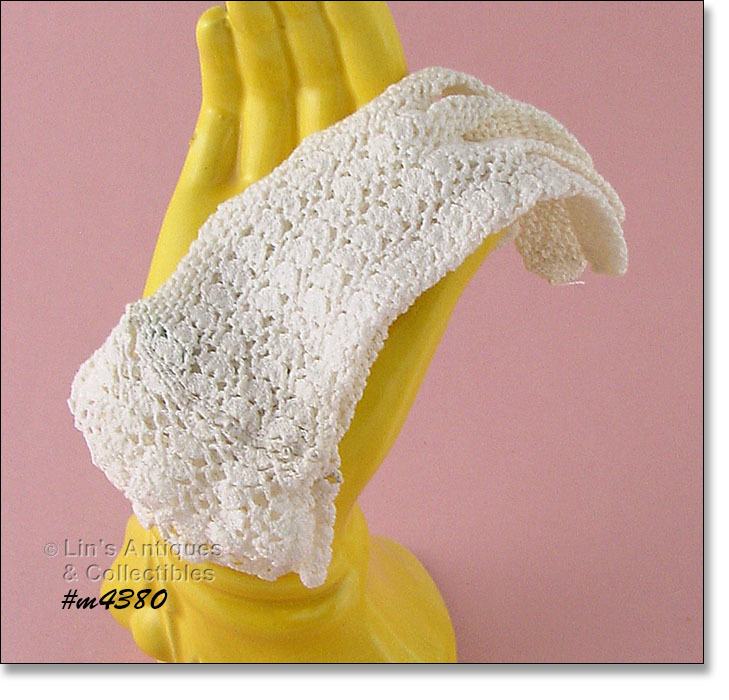 THIS LISTING HAS A PAIR OF WHITE CROCHET GLOVES! THEY MEASURE 8” TO TIP OF MIDDLE FINGER AND ARE SIZE 5 ½ - 6. GLOVES ARE IN SUPER CONDITION BUT I NOTICED BOTH HAVE SOME BEIGE COLOR THREAD AT INSIDE HEM THAT APPEARS TO BE ORIGINAL TO THE GLOVES (NOT A REPAIR) – PERHAPS FROM A LABEL? ANOTHER VERY NICE PAIR OF GLOVES! THESE ARE A PRETTY NAVY BLUE COLOR, SIMPLY STYLED WITH NO ADORNMENTS. MEASURE 13 ½” TO TIP OF MIDDLE FINGER AND ARE SIZE 6 ½ - 7. 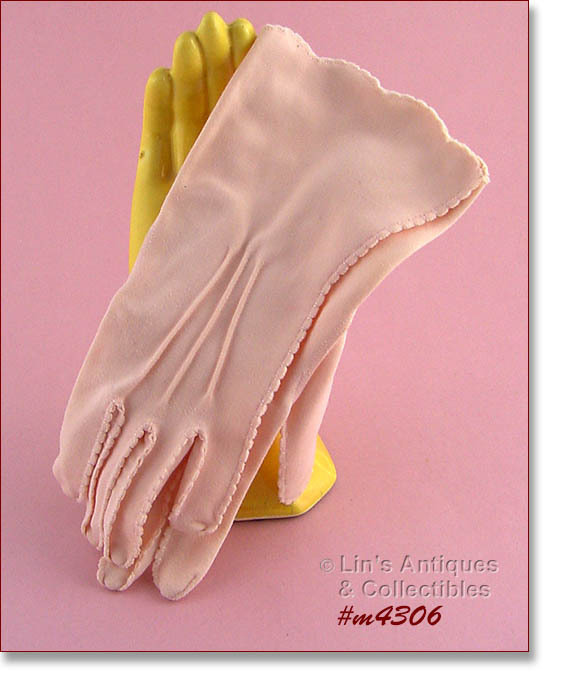 VERY PRETTY PALE PEACH COLOR GLOVES! MEASURE 9 ½” TO TIP OF MIDDLE FINGER AND ARE SIZE 6-6 ½. 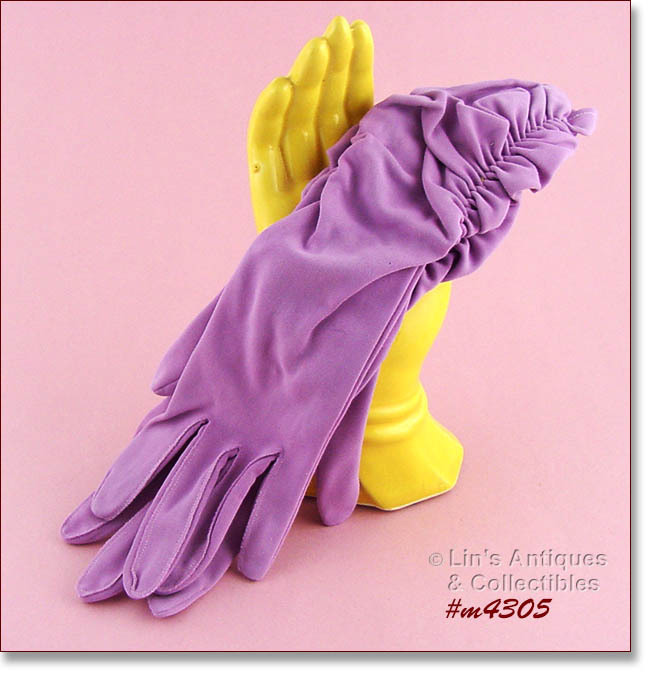 THESE GLOVES ARE A PRETTY LILAC/LAVENDER COLOR! MEASURE 14” TO TIP OF MIDDLE FINGER AND I WOULD ESTIMATE THEM TO BE SIZE 6-6 ½. VERY NICE! LOVELY WHITE GLOVES! THESE ARE NYLON AND THE “CUFF” HAS EMBROIDERED RIBBON BOWS. GLOVES MEASURE 9 ½” FROM EDGE OF CUFF TO TIP OF MIDDLE FINGER. I WOULD ESTIMATE THEM TO BE SIZE 5 OR 6. THERE ARE SOME MINOR IMPERFECTIONS – SOME LOOSE STITCHING ON THE CUFFS – NOTHING MAJOR BUT PRICE REFLECTS MINOR IMPERFECTIONS. 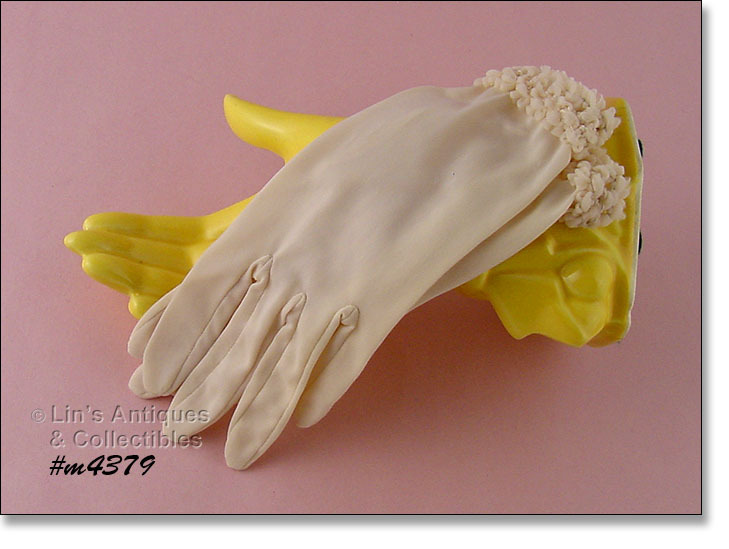 I HAVE TWO PAIRS OF THESE GORGEOUS NEW CONDITION VINTAGE GLOVES! GLOVES ARE WHITE WITH LOTS OF FAUX PEARLS AND PEARL BEADS. THEY ARE A STRETCH NYLON MATERIAL AND WILL FIT UP TO A SIZE 7 – I WEAR SIZE 7, THEY FIT GREAT AND ARE BEAUTIFUL ON! GLOVES ARE IN THE ORIGINAL PACKAGE THAT STATES “WASHABLE, STRETCH NYLON, MADE IN THE BRITISH CROWN COLONY OF HONG KONG, ALL SIZES”. 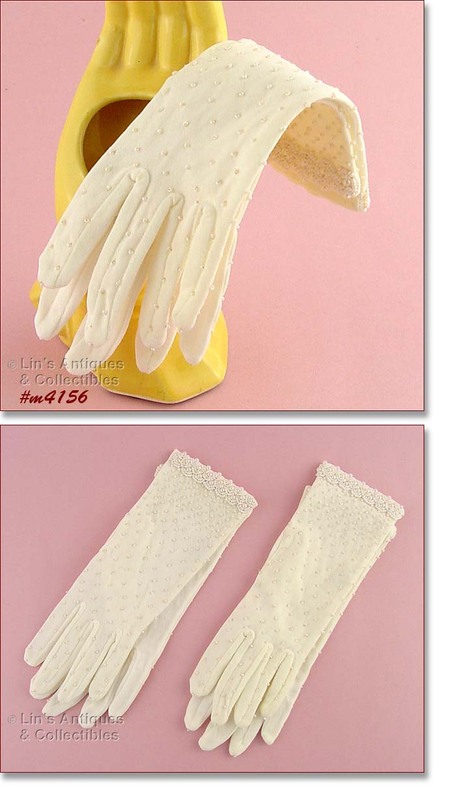 THESE GLOVES ARE SUITABLE FOR A WEDDING!